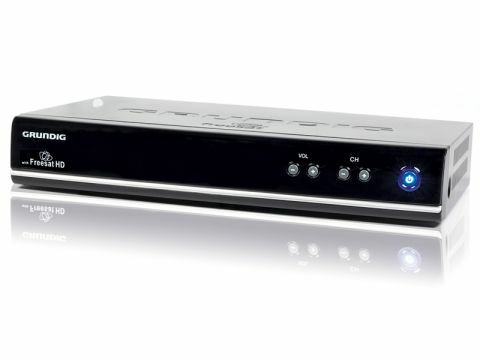 The amusingly titled GUFSAT01HD from Grundig is one of three near- identical Freesat HD receivers made by Alba Group PLC. Its siblings, the Bush BFSAT01HD and Goodmans GFSAT200HD, offer only marginal cosmetic differences. Beneath the hood they're identical. At home with both MPEG-2 SD and MPEG-4 HD broadcasts, this small box is a dream to install and use. Provided you have a dish (a new Freesat installation or an existing Sky one), you simply connect the F-type LNB lead and choose a hook-up. The best bet is the HDMI output, but there's also a Scart loop-through (no HD via this, though) and an optional optical digital audio output if you want to route audio into a receiver. At the time of writing the Grundig's Ethernet port had yet to be activated. Setup is quick and easy. You're asked for a postcode to ensure you get the correct regional programming, and then the channels download. It's much faster than a Freeview installation. Picture quality is great. The channels themselves are the same transport stream as their counterparts on Sky, and look no different. The best SD channels are crisp and spry. Currently the only HD service available is from the BBC, and this looks sublime. ITV offers an HD opt-in via the Red button service, but after Euro 2008 it has been dormant. No component output, but that's hardly a deal-breaker. With no fascia display, it's impossible to work out what the GUFSAT01 is doing. Weirdly, you get a blue-light when it's off, but nothing when it's on.